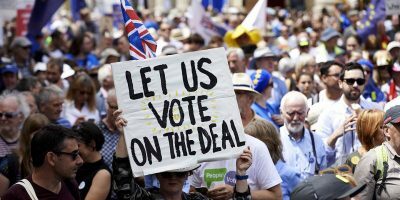 The consequences of the Brexit self-delusion are now becoming obvious, as Britain’s government finds itself unable to get a parliamentary majority for any realistic plan to leave the EU. If this situation persists, Britain will have only one alternative: another referendum to reconsider the impossible result of the 2016 vote. In 2016, the British people voted to leave the European Union while keeping “the exact same benefits” they enjoyed as EU members. David Davis, May’s former minister responsible for negotiating Brexit with the EU, used that phrase repeatedly in Parliament, and it was then taken up enthusiastically by May herself. The promises by former foreign secretary Boris Johnson, the chief Brexit campaigner, were even more fulsome: Britons would have complete freedom to live, work, and study throughout Europe; untrammeled access to the EU single market; and full participation in whatever political institutions a post-Brexit government might feel like cherry-picking from the EU orchard. In short, the 2016 referendum was a vote for two plus two equals five.